Free Shipping Included! 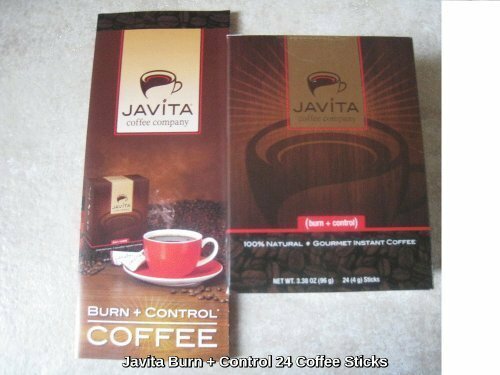 Javita (burn + control) Gourmet Instant Coffee for Weight Loss (Basic Kit - 2 boxes), 3.8 OZ each by Javita Coffee Company at Rat Coffee Shop. MPN: JCC-BC. Hurry! Limited time offer. Offer valid only while supplies last. This is for two (2) Boxes of Burn + Control Javita Gourmet Coffee. Each box contains 24 sticks which is good for 24 cups of Javita Gourmet Coffee. This is for two (2) Boxes of Burn + Control Javita Gourmet Coffee. Each box contains 24 sticks which is good for 24 cups of Javita Gourmet Coffee. We've evolved coffee by infusing phytonutrients into a blend of estate-grown coffee, providing every delicious sip with the added benefits of health and vitality. That's Javita's unique plan to distinguish its coffee from other brand - to not only give you benefits of coffee, but also the benefits of the natural herbs. GARCINIA CAMBOGIA: * Helps decrease your appetite * Helps reduce the amount of carbs stored as fat. A delicious gourmet instant coffee that helps you burn fat & suppress appetite. Manufactured in the USA and fueled by herbs that have been used since the 16th century. Yerba Mate suppresses appetite, provides sustained increase in metabolic burn & caloric burn rate. Garcinia Cambogia decreases your appetite & reduces the amount of carbs stored as fat. Dissolves in hot, warm and cold liquids - excellent for steamy, hot coffee or icy frappucinos! If you have any questions about this product by Javita Coffee Company, contact us by completing and submitting the form below. If you are looking for a specif part number, please include it with your message.